Feline hyperthyroidism is a very common disease of middle-aged and older cats. Hyperthyroidism in cats is caused by an increase in production of thyroid hormones from enlarged thyroid glands, located on both sides in the cat's neck. In most cases, enlargement of the thyroid glands is caused by a tumor called an adenoma, which is almost always non-cancerous. The average age of cats with hyperthyroidism is 13 years of age; only about 5 percent of hyperthyroid cats are younger than 10 years of age. These feline hyperthyroidism symptoms appear to get worse as the disease progresses. If hyperthyroidism is suspected, your veterinarian may take some blood in order to perform tests. A blood-chemistry panel is often ordered along with thyroid-hormone level tests. Most cats with hyperthyroidism have elevated levels of thyroid hormone in their bloodstream. Because hyperthyroidism can predispose a cat to other conditions, it is important to evaluate the cat's general health, with particular focus on the heart and kidneys. The blood-chemistry panel and urinalysis will help reveal information about other organs (liver kidneys) and provide your veterinarian with a picture of your cat's health. Radiographs and other tests may be needed in order to determine the overall health of your cat. Hyperthyroidism may cause heart disease. The heart may appear enlarged on an x-ray and may show abnormal electrical activity on an ECG. 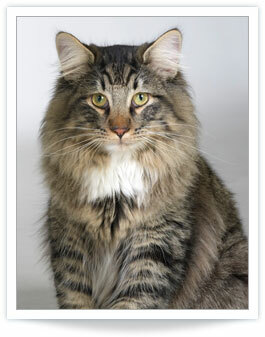 The heart disease usually reverses in most cats after successful treatment of hyperthyroidism. There are three options when considering treatment for a cat with hyperthyroidism: medication, surgery or radioactive-iodine therapy. Radioactive-iodine therapy is the most effective treatment and is now the treatment of choice for cats with hyperthyroidism. Medication: Anti-thyroid drugs act by reducing the production and release of thyroid hormone from the thyroid gland. These medications do not provide a cure for the disease and can cause side effects such as vomiting, anorexia, fever, anemia, and lethargy. Tapazole (Methimazole), the anti-thyroid medication, needs to be given one to three times daily for the rest of the cat's life. Some cat owners find it difficult to give their cats pills daily and often have their cat treated with radioactive iodine at a later time. Surgical Treatment: Surgery for removing the thyroid glands requires general anesthesia and is risky for older cats. Another added risk associated with the feline hyperthyoidism surgical procedure is damaging the cat's parathyroid glands. The parathyroid glands are located within the thyroid glands and are crucial for maintaining stable blood-calcium levels. Radioactive-Iodine Therapy - Treatment of Choice: Radioactive-iodine therapy is the treatment of choice for cats with hyperthyroidism. During treatment, radioactive iodine is administered as an injection and is quickly absorbed into the bloodstream. The iodine is absorbed and destroys the abnormal thyroid tissue but does not damage the surrounding tissues or the parathyroid glands. The advantages of radioactive-iodine therapy are that the procedure is curative, has no serious side effects, and does not require surgery and anesthesia. It does, however, involve the handling and injection of a radioactive substance that is only permitted at facilities specially licensed to use radioisotopes. Thyro-Cat facilities are specially licensed and built exclusively for I-131 treatment of feline hyperthyroidism. They are fully licensed by the State Departments of Health and the Nuclear Regulatory Commission.